Kerry Walmesley, Stockport Conservation Management Trainee, called a meeting recently to go through the nominations for local listing. 372 buildings and structures have been surveyed by Kerry of which 218 were nominated by members of the community/interest groups. Kerry has made a number of recommendations and has identified a number of buildings of exceptional interest with potential for statutory listing. 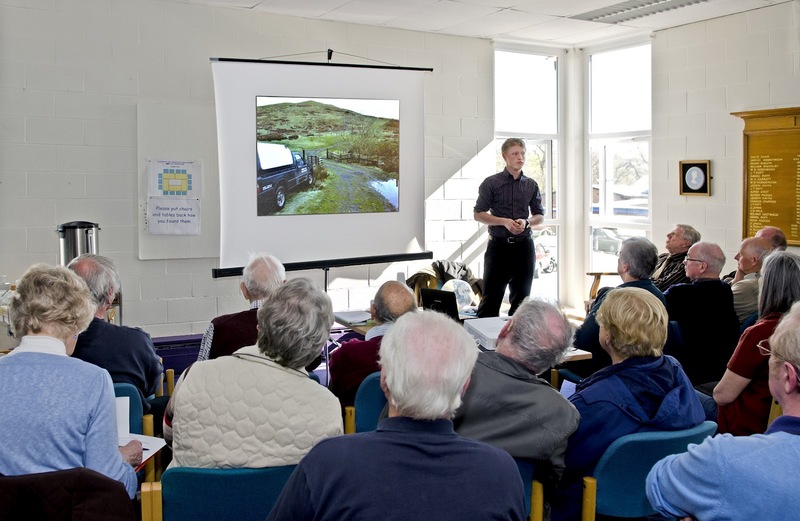 The Annual General Meeting was held in Marple Library on Tuesday 24th April 2012. David Ackroyd stepped down as chairman after 2 years in office and Gillian Postill was elected as the new chairman of the society. Following the election of officers and committee Andrew Suggitt, an ecologist from York University, gave a presentation on global warming and the potential effects on Marple in years to come. Congratulations to Craig Silcock, youth workers and all the young people who took part in "Get Out and Love Marple". 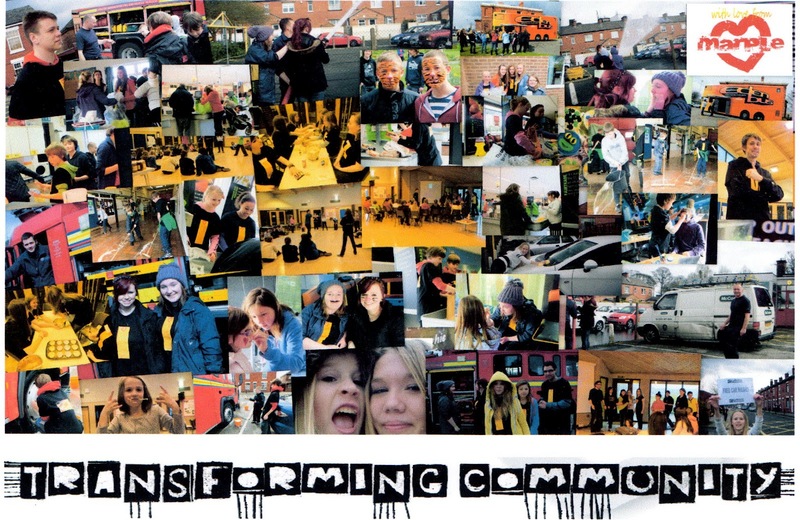 Last week 30 youth workers and 50 young people took to the streets of Marple to make a difference in our community. 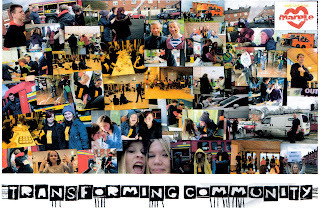 They took part in a wide range of projects including gardening, car washing, litter picks and many more. The society helped to identify possible projects and received this lovely card from the young people as a "thank you"
April saw the start of work to replace Marple Station Footbridge with a new bridge to provide disabled persons access to both platforms. At the planning stage of the project it became clear that the old station foobridge would have to be removed due to lack of space. The old bridge is the last link with the orinal Victorian station and many felt it would be a sad loss. Initial talks with Cllr Craig Wright in 2011 looked at alternative sites for the bridge around Marple. In the event no suitable site could be identified locally. However, Peak Rail at Rowsley in Derbyshire have agreed to take the bridge for their preserved railway. A suitable plaque will be attached giving details of the bridge and where it came from. Thanks to Cllr Craig Wright for facilitating the finding of a new home for the bridge at Rowsley. We are grateful to member Arthur Proctor for taking shots of the old and new bridge during installation. The society's Honorary Architect has examined the application and responded on behalf of the society. 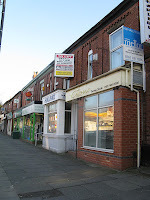 In principle the society has no objection to the use of this site for housing. However, we feel that there are aspects of the design that are not appropriate to the adjacent terrace. The size and scale of the building is out of character with the rest of the street, the building having a somewhat squat, horizontal appearance. Arched windows and garage door would help, as would a steeper roof line. A street scene drawing would be useful to illustrate these points. The balcony to the rear of the property presents a further problem in that it overlooks houses on Stockport Road. The Toll House and adjoining cottage at Marple Wharf will feature as an entry in the forthcoming Save Britains Heritage 'Building at Risk' register. SAVE is an influential group which campaigns effectively for endangered historic buildings. Marple Civic Society presented a Business Plan to British Waterways (BW) two years ago to turn the grade ll listed buildings into a visitors centre but to date we have not received any comment or even acknowledgment. 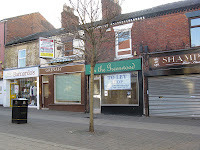 The buildings remain empty and boarded up and although they are generally in good condition they are subject to vandalism and risk of damage as has happened recently. In June this year, when the buildings feature in the 'Buildings at Risk' register, BW will become the Canal and River Trust (CRT) a charity being set up to look after the canals and their heritage and to encourage local people to get involved as volunteers. Lets hope that the coinciding events in June kick start BW (CRT) into action to think again about the listed buildings and the Marple Wharf Heritage site. The delightful grade ll listed Toll House and adjacent cottage at Marple Wharf. Boarded up and prey to vandalism. As part of the Marple Vision Partnership, the Business Forum, supported by Marple Civic Society has made a joint bid for up to £100,000 for Marple from the governments Portas Pilot Scheme. The plan and bid proposal focus on ways to develop, brand and promote Marple Town Centre as a great place for a day out, to encourage more visitors to come and experience Marple. 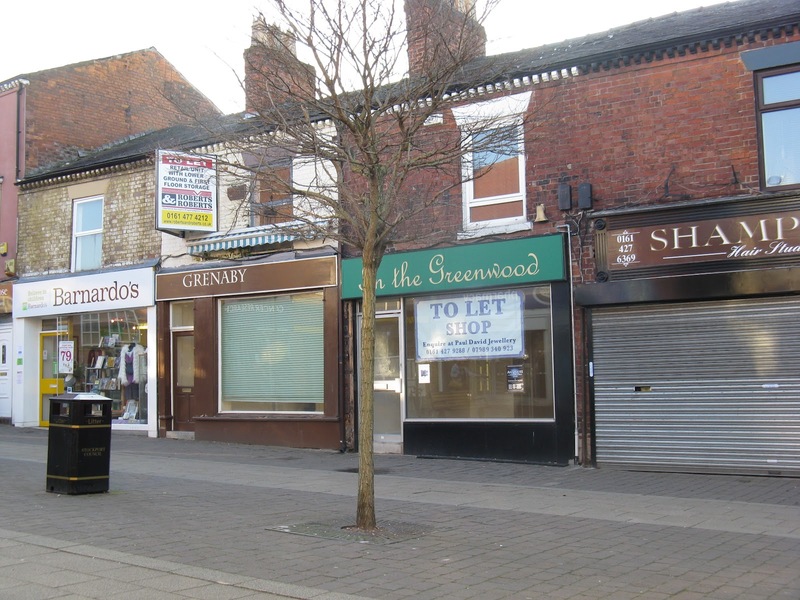 A successful bid and a little initiative could help turn Marple into a shopping haven, a vibrant and lively town where residents want to shop and visitors return time and time again. ﻿There is nothing to report from the Marple Area Committee Meeting this month due to the approaching local elections. During this period, elected representatives are not allowed to discuss local issues including planning applications. We will be back to normal after the May elections. We recently learned that the HLF bid applications by British Waterways and Mellor Archaeological Trust were both unsuccessful. Of course, this was a disappointment after so much work had gone into preparing the bids. However, all is back on track following the HLF feedback meeting today. After discussing both bids and their strengths and weaknesses it was decided that the best way forward is to join forces and submit a joint bid. Both projects are closely linked historically and geographically and will therefore work well as one bid submission. 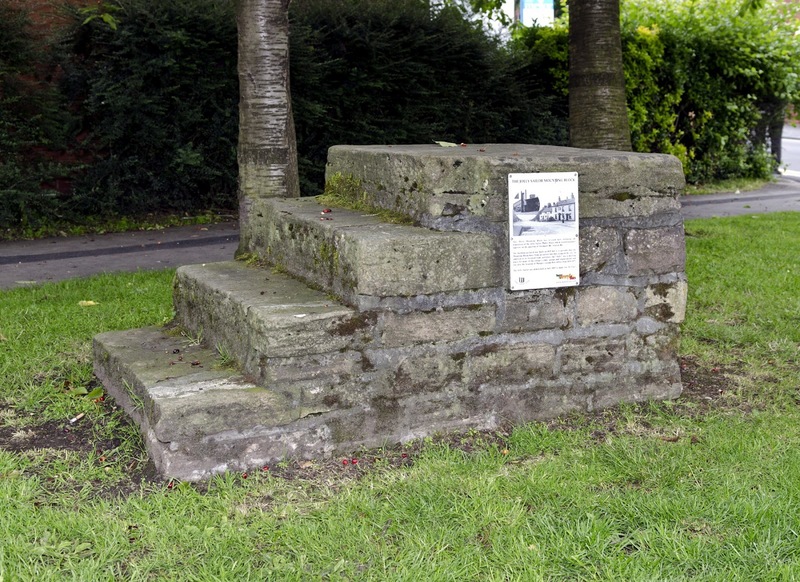 Representatives from Stockport MBC, Mellor Archaeological Trust, British Waterways, Marple Civic Society and Marple Vision Partnership will meet on 24th April to discuss the best way forward.